The direction is changing from headwind to tailwind. After many loss-making years, frequent management changes and despite constant restructuring measures and saving programs, Air France-KLM-Martinair Cargo seems to finally getting back on its feet. The man responsible for the imminent U-turn is Marcel de Nooijer, a team player and strong supporter of innovative business models. Rotterdam-born Marcel de Nooijer, aged 48, is a true cargo veteran having worked for KLM and Martinair since 1995. 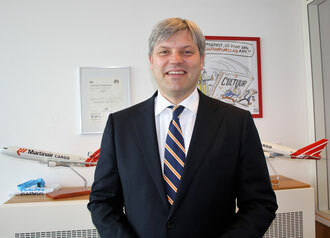 He took the next step on his career ladder last December, when he became head of AF-KL-MP Cargo replacing Bram Graeber who left the company. From mid-December until today is a rather short period of time to start moving things ahead and setting new signs. But these few months in office have obviously been sufficient for Marcel and his management team to outline a future-oriented holistic strategy for getting the ailing cargo unit back on track fast again. “This was only possible by a collaborative team effort, whereby I’m only one amongst many,” he stresses, giving credit to his colleagues. A closer look reveals a number of groundbreaking initiatives that, considered as a whole, resemble a silent revolution almost unnoticed by the outside world. To start with, there are new vertical alliances initiated by AF-KL-MP Cargo in accord with forwarding agent Kuehne + Nagel, ground handler Swissport, trucking company Jan de Rijk and the customs authority at the freight carrier’s home base Amsterdam Schiphol Airport. It’s an exemplary partnership for testing and learning purposes, involving the entire supply chain, from the acceptance of goods at the doors of the shippers until the loading of the consignments on board a KLM or Martinair operated aircraft at AMS. For gaining experience and fine-tuning processes, the feeder route Frankfurt-Amsterdam has been selected for initial trials. 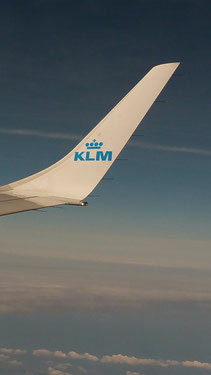 The project is labeled “European Green Fast Lane” and runs since September of last year when Marcel was holding the position of Executive Vice President of KLM Cargo. The recognition gained during this test phase, based on constant data monitoring is stunning, he states: The visibility improved, so has the grip on information thanks to cloud-based IT management solutions, and mistakes were reduced remarkably. Applauds manager de Nooijer: “Thanks to joining forces with suppliers, handlers and agencies the product quality on the lane FRA-AMS has improved on average by a staggering 15 percent.” Chapeau! Just as important is that the results gained from these trial runs has enhanced the carrier’s reputation in the broader cargo landscape in terms of efficiency and reliability. Step 2 is now to follow: “Similar vertical partnerships resembling the Frankfurt model we intend rolling out at another 120 trucking points all across Europe,” Marcel announces, with all processes based on information exchange via cloud. This all-time visibility enables KLM Cargo to plan freight flows pro-actively, to reducing mistakes and make most paperwork redundant. The completion of the project, he estimates, will take 1.5 years. Simultaneously, AF-KL-MP Cargo continuously plays the card of horizontal airline pacts actively, targeting the cargo division of Mumbai-based Jet Airways to jump on the partnership bandwagon. “Fact is we are zooming in on our Indian codeshare partner to further strengthen our mutual market position by sharing capacity and offering clients a wider reach through a combined network,” Marcel confirms. Once realized, it could be another groundbreaking agreement following the Franco-Dutch freight carrier has signed earlier with Delta Cargo and China Southern Cargo many years ago. The industry benchmark JV with Delta Cargo (and Alitalia Cargo) has shown benefits for key JV components like metal neutrality, a one-stop shopping portal, under one roof concept as well as a common cash box for sharing revenues and costs on sectors linking Europe and the USA. This would be a leading example for new partner developments such as Jet Airways.